The Downtown Disney District is undergoing some very exciting changes in 2018! With the relocation of The House Of Blues, Downtown Disney gained an awesome new family friendly venue in its place called Splitsville – A luxury Bowling lane/restaurant and Bar. This new entertainment concept boasts 20 bowling lanes interspersed throughout the location, four dining areas (indoors and out), more than 25 flat screen TVs, and the ability to host both live performers and DJs. The building fuses both modern and retro chic elements with lots of white, brick and bright neon colors. There is a really nice outside patio with a cozy fireplace where you can relax and watch live music. We went on a Friday night and listened to a nice duo performing some of our favorite songs. The atmosphere was casual, fun and friendly. Speaking of friendly, the servers are so good with kids! We arrived a little early on the day we went and while we were waiting for our friends a lovely young woman by the name of Adenaline (Yes, Adrenaline) came over and sat down next to my daughter and chatted her up for 10 minutes. She even played a couple games of I-Spy with her. I loved how she brightened our day and put a big smile on my daughters face. That is what I call excellent customer service! Craving a cocktail? Splitsville has you covered. They have a variety of options such as hand crafted spirits, bowl drinks and 16oz. drinks. One of my favorite drinks was the Blue Flame. It had deep Eddy lemon Vodka, blue curacao, lemon juice and simple syrup. Jet juice was also a good choice and it is made with grain alcohol of your choice and Orange Juice. They also have mules, Margaritas and so much more. Blogger Tip #1: You can order a 22oz cocktail in a souvenir squeeze bottle for $22 and refills are $15. Art plays a huge part of Splitsville. There are 4 giant murals painted throughout the bowling alley and they were all painted by a gentleman named Matt Calahan. Matt has painted all of the murals at the other Splitsville locations for the past fifteen years. The murals depict local icons and has a California cool and vintage theme. When you first walk into Splitsville you will see a dramatic and large dining room with floor to ceiling windows where customers can get a great view of Downtown Disney while they dine. The restaurant can accommodate up to 1,000 people and you can rent out sections for private events such as birthday parties, team building experiences, corporate events and more. Blogger Tip #2: You do not need to bowl to dine at Splitsville. Dining and bowling are booked separately, so you can pre-book your lanes or just stop by for a delicious meal. Splitsville does not serve the typical “alley” food. When I visited I was so impressed with not only the selection of choices from the menu but the quality of the food. Sure, you can order a burger and fries or a pizza but why not try some amazing Sushi rolls? All of the sushi is made fresh daily in their open kitchen and you can even watch the sushi chefs prepare it through the glass windows. All of the Ahi that I tried was incredibly fresh and all of the avocado was perfectly green and soft. I highly recommend the poke bowl and you can ordered it with a bamboo rice blend (mix of brown rice and quinoa) or just ask for plain white rice. Both are delicious! The grilled Ahi and avocado tuna is also a winner. Served in a halved grilled and filled Avocado, it is filled with a generous portion of Seared Ahi Tuna, tossed with Spicy Kimchi Ponzu Sauce topped with Scallions and Spicy Mayo and served with Sushi Rice and crispy Wonton Chips. It’s Disney so there is plenty of kids choices to pick from. My daughter enjoyed the chicken tenders and my friends son loved the BBQ chicken pizza. They also have grilled cheese, pasta and hot dogs. If you like french fries they have the really cool crinkle cut ones and an appetizer called “Loaded Fries” where they are smothered in Queso Blanco, Bacon, Ranch, and Scallions. Those are highly addicting. Don’t say I didn’t warn you. 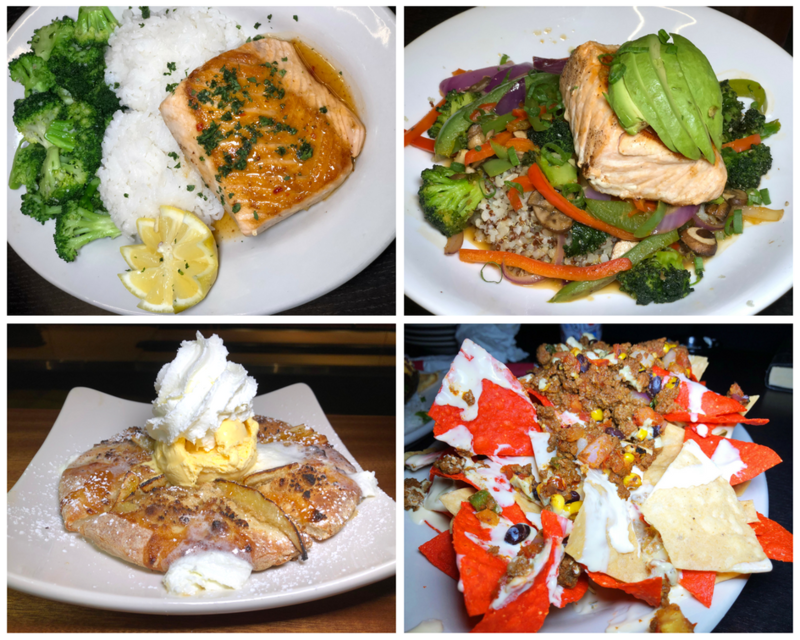 If you prefer to eat on the lighter side, Splitsville has salads and plenty of salmon options. A friend enjoyed grilled salmon served with Garlic Butter Broccoli and Sushi Rice, another friend enjoyed a Spicy Veggie Bowl with Grilled Salmon. That had Broccoli, Kale and crisp Mixed Vegetables stir-fried in spicy Kimchi Tataki Sauce and topped with Avocado and Green Onions served over either Sushi Rice or a bamboo blend. Definitely leave room for dessert! They offer a Banana Streusel Pizza with House-made Pizza Crust, Banana, crunchy Streusel, Caramel Sauce, Vanilla Ice Cream, and Whipped Cream. Blogger Tip #4 Kids can order an ICEE with blue raspberry, coke or cherry flavors. Overall I thoroughly enjoyed our experience. I like that even though this is an upscale bowling alley, it is still kid friendly, makes a perfect location for a date night, and also offers a place to sit and unwind with live entertainment. With all of the hustle and bustle inside Disney Splitsville is a welcomed place to unwind and socialize for some fun-filled competition. Blogger Tip #5. Bring Socks. However, if you forget you can buy socks for $7.54 (includes tax) on-site. For more information visit Splitsville on Facebook and Twitter.